We finally got around to updating our Guide to Business Class Lounge Access. It has more credit cards listed, pricing updates for single entries and annual memberships. Read the updated Guide here! We have also updated our Holiday Shopping piece with the latest online shopping bonuses from Aeroplan and AIR MILES. 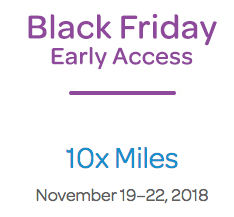 Both programs are offering up to 10x miles. Find out more here.